Hopefully, you've had a nice winter off your bike. Now it's time to get back on your neglected, two-wheeled friend. If you've spent the past months on skis, boards, or couches, you may be surprised to see just how rusty you and your bike may be. So please come join us on the first beginner ride of 2014. 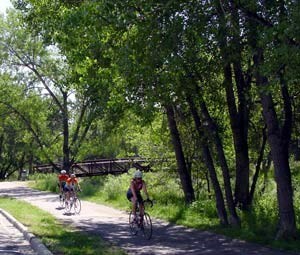 We'll ride the paved Clear Creek trail from Wheat Ridge to Golden and back. The round trip measures about 18 miles. To celebrate the very popular Tres de Mayo holiday, we'll break for lunch and margaritas at El Dorado Mexican restaurant in Golden before heading back (downhill!). This event was added on 3/19/2014 by an RMBB member and was last updated on 5/4/2014 by an RMBB member.